Ad Nauseam: Boehner Promises One Iran Bill Every Week……. That would be the Corker, er, Menendez, er, AIPAC Bill. My Georgetown source (no, she is not Saudi ambassador Al Jubeir and does not frequent Cafe Milano with Arbabsiar and Mexican drug cartel types) reports the following interesting plan. If pressed by the harried media, which he probably won’t, Boehner will admit that the congressional goal is to speed things up: to introduce one Iran bill each and every week. Congressional bi-partisan carpet bombing of the Iranians (and Obama). He added that Tom (Cotton?) had originally wanted a bill each and every day. In addition to a new taunting letter sent to Ayatollah Khamenei each and every day. He was talked out of it. That way, he added, the Iranians may eventually see the light of day and give it up. When asked: what about the Europeans, Russians, Chinese, Indians, etc? Will they not understand the game and give up the sanctions as well in that case? He replied: that is not the script according to Bibi………….. The New American Jihadist Movement: Over There …….. He said: “impose penalties not only on those who broke the law but also on their relatives, including their “great-grandkids,” “to the third degree of sanguinity.” But then he was a brash young man at the time. A brash middle-aged but powerful man can be even more dangerous. The various American wars in the Middle East and in Muslim lands have created a whole cottage industry of people and institutions that profit from warmongering and guilt by association. And the prospects are promising for more. Never been more promising. They have had their eyes set on an Iran war, Mother of all Middle East wars. Even the Bush (43) chickenhawks would not take the plunge: shows you how far the Republicans (and a few Democrats) have gone. Imagine how long it could last and how much it would cost and how high some defense company shares can go. And how higher that would raise the barrier along the Jordan River, even higher, one of the goals that are not articulated. Oh, and about “the letter” to Iran meant to scuttle the nuclear negotiations and possibly provoke a new Middle East war. Juan Cole reports that Tom Cotton received over $700, 000 for his senate campaign from the right-wing Emergency Committee for Israel, another group of well-funded and frustrated but hopeful chickenhawks. Principles, even those of warmongering, don’t come cheap. But then most Republicans and many Democrats in Washington already know that. It is a new American Jihadist movement. Just like the terrorist Caliphate of ISIS, it seeks to dominate here and to impose its will and that of its donors ‘over there’. Through continued political war here, and continued military campaigns ‘over there’. That requires a lot of money. Five Dollar Bill: Forget Canadian Spock, USA to Replace Abe with Bibi……. My very own special incredible Congressional source is reporting that this Canadian move has inspired the U.S. Congress. If the Canucks can honor Mr. Spock (Nimoy) on the $5 bill, why not the US? So, she reports that a bi-partisan group of representatives and senators are getting ready to propose a similar U.S. move. No, it has nothing to do with Spock. Fresh from their verbal oral interaction with Benyamin Netanyahu last week, still in the grips of the afterglow, the law-makers will propose that the USA replace Abe Lincoln with Benyamin Netanyahu on the $5 bill. With the cost of living and ‘entertainment’ now so high in Washington, they claim, Abe Lincoln can’t buy you as much as he used to. Americans will have the joy of carrying Bibi in their wallets, and even giving him back to the tune of $5-6 billion every year. Besides, it is a New Republican Party now, it needs a new symbolic and final break with its distant shameful and inconvenient past………. A Fatwa on the Nuclear Deal: What If……..
From the Netanyahu speech and the orgasmic reaction of the members of the U.S Congress, we have learned that it all has little to do with the nuclear issue as far as Israel and its Washington lobby are concerned. It is more about forcing a certain foreign policy path on the Obama administration so that it would try to force certain regional policies on Iran. Which means it is aimed at certain failure and increasing tensions in the Middle East, possibly leading to another war against yet another Muslim country. But Netanyahu has no intention of waging a futile war alone: he wants to drag the United States into it. Which might mean creating and inviting Shi’a extremists to open a second front against the West. Great, so much for the ‘war on terror’. What about the rest of the world? The Germans, Russians, French, Chinese, British, and billions of others who are not Netanyahu cheerleaders? The rest of the world that is not necessarily captive to moneyed American or Israeli lobbyists, powerful special interests, Rapture-obsessed evangelical Christian Zionists, and bigoted Las Vegas tycoons? Those who are truly concerned about the nuclear issue and have no other ‘foreign’ agenda imposed on them? If they like ‘the deal’ but Washington is too afraid to accept it? They are likely to reject American dictates, which in that case would be Israeli dictates. The sanctions will get much weaker, since they will become even more unilaterally American. Can the extreme right wing in America, the half of the government that is a proxy for the extreme Israeli right wing, force its agenda and the Iran blockade on the rest of the industrial world? On the rest of the world? Highly unlikely……….. 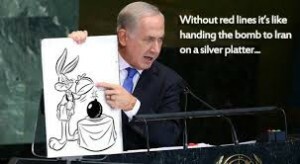 The Bibi Political Circus Hits Washington: Netanyahu’s Nuclear Looney Tunes………..
A polarizing figure, a celebrity, and a supremely opportunistic politician. Now he brings his circus into enemy territory: Washington DC. It has been a circus,a diplomatic and political and media circus these past few weeks. Of the kind that only a celebrity (in America) like Netanyahu could deliberately provoke and organize. Besides Israeli politics he also seeks to deliberately embarrass and disrespect the black man he probably detests the most: Barack Obama. He would never do that to a white president. He also knows the nuclear negotiations have their own logic, be they successful or not. Folks at the White House consider him a ‘chickenshit’. Many Democrats, be they Jewish or gentile, see him as either a chickenshit or just a political hustler following his only path to keeping his job. Most of them would not dare say so publicly. Some of them have already decided to throw Obama under the bus and attend the Netanyahu political rally. Most Republicans see him as the man who will lead the Jewish people to a belated conversion to the old Jewish sect of Jesus Christ. At the time of the Rapture. A couple of star-struck extreme American neoconservative groupies even have a form of man-crush on him. They have taken to comparing him to Churchill, evoking Munich and the Holocaust and all that. 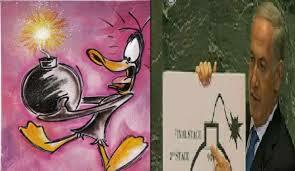 Will he use his staple of Looney Tunes Road Runner WileCoyote cartoons again to illustrate the nuclear issue? It should be interesting when the the bull is spread and let us see how much of it sticks to the ceiling of the Capitol.